The Bureau of Land Management's Sept. 11 auction of 295,174 acres in the Silver State drew zero bids, fueling green groups' criticisms that the federal government is ignoring market demand in its quest for "energy dominance" on public lands. The sale was one of several held by BLM this month. Western Energy Alliance President Kathleen Sgamma added to the mix her own nuanced criticism of the Nevada lease sale. "You have a bad actor that is nominating millions of acres no one is interested in, and it's wasting BLM's time, it's making industry look bad ... and it's skewing BLM's statistics," Sgamma told The Nevada Independent and other news outlets recently. After the Western Energy Alliance tweeted Sgamma's quote from The Nevada Independent story, the Wilderness Society, an organization that is often at odds with the trade group, voiced its agreement. 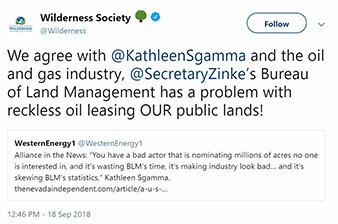 "We agree with @KathleenSgamma and the oil and gas industry, @SecretaryZinke's Bureau of Land Management has a problem with reckless oil leasing OUR public lands!" the Wilderness Society tweeted Tuesday. Sgamma said parties that nominate unwanted acres are to blame — not BLM. She noted that a lease sale is just the first step on the long road toward drilling a well. The Trump administration has prioritized expediting that process through actions such as streamlining National Environmental Policy Act analyses, which has frustrated groups calling to maintain the same level of public input in the process. The administration has also pushed for a quarterly lease sale schedule, and BLM has obliged. "Companies who are legitimate lease brokers and want to operate do a lot of work to identify acreage they want to nominate," Sgamma said. "They don't just do this blanket, throw everything at the kitchen wall approach. They put time, effort and money into the nomination process." A record-breaking two-day sale in New Mexico's share of the oil-rich Permian Basin that drew nearly $1 billion in high bids is a perfect example of leasing done right, Sgamma said. "Holy cow, that was a big one," she said. "One hundred forty-two parcels generated that much money. That's amazing." After the New Mexico sale, Interior Secretary Ryan Zinke crowed that the results would have critics of the Trump administration's energy push "eating their words" (Greenwire, Sept. 7). Not exactly, said Nada Culver, senior counsel and director of the Wilderness Society's BLM Action Center. "It's so shortsighted to just say that this sale worked," she said. "This just highlights why these other sales are so irresponsible for fiscal reasons and every other reason." Culver called on BLM to take a more active role in sussing out which nominations are unlikely to draw bids or yield hydrocarbons. "The backstop to this is supposed to be our federal government," she said. "Just as the New Mexico sale shows how our government is supposed to administer our federal oil and gas program, the Nevada sale shows how our government is not supposed to administer our federal oil and gas program." In an Aug. 31 subcommittee meeting of Interior's royalty advisers, BLM emphasized its "current view point" on leasing. "[I]f industry is willing to put dollars on the table then BLM will lease," the bureau said, according to meeting notes. BLM held its first Arizona lease sale on Sept. 6. The auction drew scrutiny because of its proximity to the Petrified Forest National Park. Three parcels — all of which were subject to protest — drew $10,960 in total receipts. Two of the tracts went for the minimum $2-per-acre bid, Culver said. The lack of competition is a problem, she said, because companies are able to buy up leases on the cheap and keep them for years. "That one was very concerning because Arizona is not known for being a hotbed for leasing," Culver said. A Sept. 6 lease sale in Colorado brought in more than $3 million in total revenues across more than 8,000 acres. BLM's state office this summer announced its plan to defer most of the land slated for auction — 18,000 acres — as it consulted with the Navajo Nation (Energywire, July 11). "It's concerning that they got that far without the consultation, but yes, of course it's good that they realized this and didn't push forward," Culver said. Groups that had asked BLM to stop or delay the leases due to proximity to the Great Sand Dunes National Park and Preserve cheered at the news. Colorado native Ken Salazar, who held the post of Interior secretary under former President Obama, said during an industry gathering that the parcels were "way on the other side of the mountain" from the park. Oil and gas companies gobbled up all of the remaining 20 parcels, this month's lease sale results show. Oil and gas operators also bought up 100 percent of the parcels offered in Montana's Sept. 11 sale. Twenty-two tracts in North Dakota and 3 parcels in South Dakota drew $223,022 in bonuses and advance rentals, according to the sale statistics. Protesters convened at BLM's Salt Lake City office to dispute a Sept. 11 sale that included acreage in the San Rafael Swell and close to Canyonlands National Park. The Trump administration should have heeded public calls to keep some areas free from drilling, said Jerry Otero, senior manager of the National Parks Conservation Association's Southwest energy program. "If you overlay an industrial use without real consideration of other uses, particularly a national park, that's a real concern," he said. BLM sold 63 percent of the parcels and collected more than $3 million in total receipts, the sale results show. Wyoming BLM unloaded 85 percent of the 353,200 acres it offered this week. Many sold above the per-acre minimum, for a total of $60 million in high bids..
Zinke announced in July that Interior had deferred nearly 5,000 of the acres originally planned for auction due to conflicts with a critical mule deer migration corridor (E&E News PM, July 31). Tracts with less than 90 percent overlap with the corridor were still included in the sale but will carry special leasing stipulations, Interior said. The agency's concessions were far too minimal, Otero said. "We have to seek some long-term solutions," he said. Wyoming wildlife advocates called to defer leases until the Rock Springs Field Office updates its Green River Resource Management Plan, which was finalized in 1997. 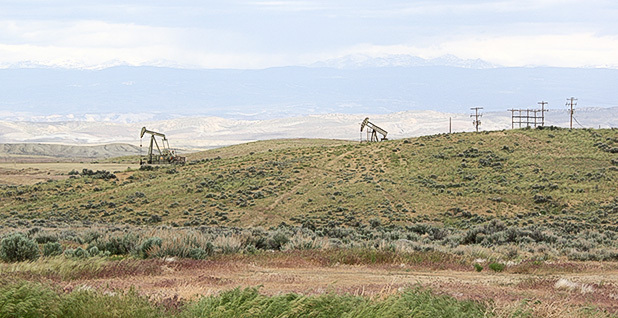 "Deferring doesn't mean withdrawal, and these same leases can be offered in the future once an upfront comprehensive plan for oil and gas leasing in these critical areas is developed," said Joy Bannon, policy director for the Wyoming Wildlife Federation. "A smart-from-the-start plan reduces conflicts; incorporates local input; and provides balance for economic, conservation and social concerns." BLM will hold its next round of lease sales in December.